Few series have been as revolutionary as Breaking Bad, few plots have given us such huge adrenaline shots. 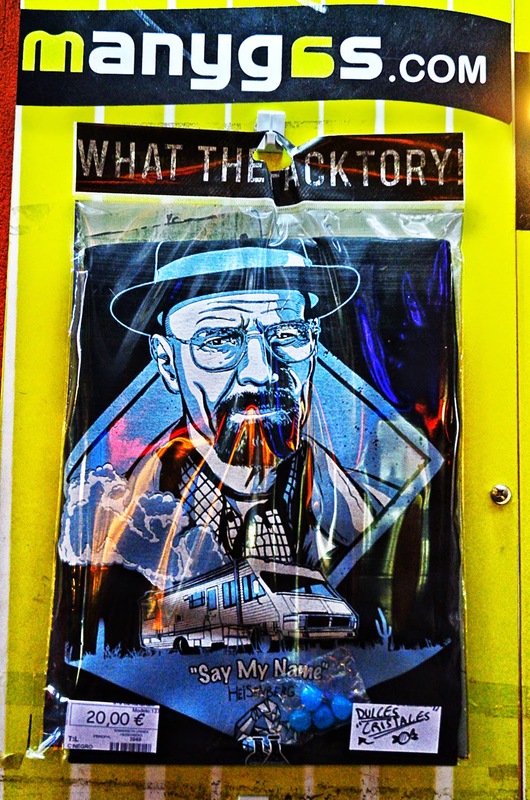 Mr. Heisenberg or Walter White, here in this t-shirt I found displayed at a small shop in Verdi street, Gracia quarter, Barcelona, emulates some sort of Raskolnikov that debates himself between between crime and punishment, driving his family to the verge of chaos while trying to save them from financial problems. Slinging meth in Alburquerque, New Mexico, this model father diagnosed with cancer, this renown chemist, sets himself into a vertiginous journey towards the destruction of the most basic principles of humanity going from complete ingenuity to a full implication in crime that reminds me of James Cagney in the famous movie, White Heat, when he yells "Made it ma, top of the world!". I never was fond of TV series, but Breaking Bad really has left a very good impression inside me. I would gladly pay the 20 euros they charge for this breaking T-Shirt! It's a shame they decided to finish the saga with the fifth season. I want more of Los Pollos Hermanos, Walt, Pinkman and Hank. I want more of a series where the good guy is more like you and me, a mixture of good and evil, a real person.